Samsung had already announced its pricing details for its full 2019 lineup of 4K QLED TVs in the US, and now its done the same for the UK. Some may be disappointed however, as the South Korean brand will sell fewer models here than what’s being offered in the US. 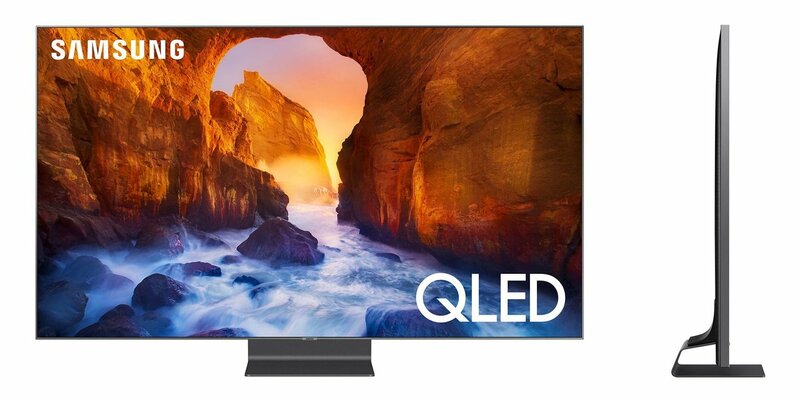 In the US, buyers have a choice of 18 4K QLED TVs across four ranges, but just 15 of those TVs will go on sale in the UK when they're officially launched on March 26. Starting with Samsung’s flagship Q90R series, these are being offered in 55-inch, 65-inch and 75-inch variants, priced at £2,799, £3,799 and £4,999 respectively. The second tier Q85R models come in 55-inches, 65-inches and 75-inches, and start at £2,299. As for the Q80R series, this is only available in a couple of sizes, 55-inches and 65-inches, with prices starting at £1,999 for the smaller of the two. The main difference between the three series has to do with the panels and the processing technologies they use. The Samsung Q90R range uses Direct Full Array Elite and Quantum HDR 2000 technology that helps to better optimise HDR content. The Q85R uses less powerful Direct Full Array Plus with Q HDR 1500, while the Q80R relies on Direct Full Array and Q HDR 1500. The Q90R, Q85R and Q80R are also said to incorporate an improved LCD panel structure that offers “Ultra Viewing Angles”. Colour spaces are expanded with quantum dot film technology, and the TVs will also feature support for Apple’s AirPlay protocol that allows for wireless streaming of iTunes content direct to the TVs. Unfortunately none of the TVs will come with HDMI 2.1 ports. Check out the video at the end of this article for a full explanation of the differences between the various models. Samsung also announced pricing for its Q70R and Q60R ranges, which are aimed at those on a lower budget. The Q70R range supports HDR, whereas the Q60R TVs sport edge LED displays which means are unlikely to be able to do so. Full pricing details for the four ranges are available on the Samsung UK website now. For those who have gardens with trees that grow money, Samsung’s higher-priced 8K TV range may be more interesting. The 8K Q950R series is available in three flavors – 65-inches, 75-inches and 82-inches, priced at £4,999, £6,999 and £9,999 respectively. The slightly less-featured 8K Q900R series is available in 55-inches, 65-inches and 75-inches, with prices ranging from £2,799 to £4,999.